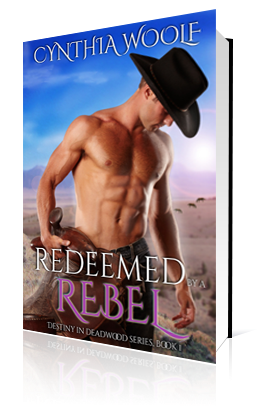 This is the third book in the Destiny in Deadwood series but you can also read it as a stand alone. Hi Zack! How are you? I’m looking forward to our interview! I can’t wait to get to know you a bit more. 1. So Zack, tell us when did you get to Deadwood? Do you like living there? I came to Deadwood with my brothers in 1876, about 2 years ago. Living here is shall we say interesting. There is no law and things can get a bit dicey sometimes. 2. Can you name one of your favorite moments since you got there? That’s easy. My favorite moment of my life, not just since I got here, is meeting Lily Sutter. 3. Who do you get along with best in your family? That’s a hard one. I would have said Jake, but I had to use my gun to get him to go somewhere. He wasn’t too happy with me at the time. I think he’s forgiven me now. 4. What things make you happy? Being with Lily and Gemma makes me happy. There is no more joy for me then being with them. 5. What things make you angry? When you put my family in jeopardy, any part of my family, I get angry and you’d better watch out. 6. What is your bigger fear? My biggest fear is losing Lily. 7. Do you think the author portrayed you accurately? I think the author portrayed me accurately. I’m pretty much the badass she says I am. 8. What do you think about the author? I love her. I wouldn’t exist without Cynthia Woolf. I always keep my promises. All a man really has is his word and if he doesn’t keep it when he promises someone something, then he has nothing. All the money in the world can’t help him, if he can’t keep his word. 10. For the sake of ladies’ curiosity… Do you have a birthmark? Where is it? What about scars? How did you get them? I have a scar down the side of my face from my eye to my lips. I was knifed by a man named Richard Jordan. I’ll pay him back for that scar. Zach reined to a stop in front of the Deadwood mercantile. He was looking forward to seeing Lily, but more importantly, Lily had a spare room and he needed someplace to live. Hopefully, she’d be willing to rent to him. He probably should get a bath and a shave before he talked to her, but he was just too dog-tired. Over the past three weeks, he’d chased Jordan to Cheyenne and then southwest toward Denver. Always behind him perhaps only minutes, but still behind. Only getting close enough once in Cheyenne, to have seen him. Jordan could have killed him then, but Zach had seen him at the last moment and avoided most of the intended damage. The knife only cut him from below his eye to his mouth. It could have slashed his throat. Bleeding like a stuck pig afterwards, Zach had to find a doctor and get stitched up. By then, he’d lost Jordan and didn’t find him again until just outside Deadwood. Jordan was returning to Zach’s home. Returning to the scene of his crime, when he stabbed Ellie, returning to finish what he’d started but Zach would not allow him to hurt his family. The problem was finding him in the throng of people that now occupied Deadwood. Thousands of people had come and more were on their way. Looking for the same kind of riches that he and his brothers had been lucky enough to find. They’d struck the mother lode with the gold claim that Lily Sutter had sold them. He should go next door and get cleaned up, especially if he hoped to have any chance of convincing Lily about the room. She wouldn’t want a boarder who was as dirty as he was. He would ask her for meals, too. He needed them and sharing a meal, spending time together at her table, would be a good chance to get to know more about her and Gemma. The little girl needed a father but until the threat that Jordan presented was eliminated, until Jordan was eliminated, he couldn’t think about that. Couldn’t think about a family of his own. They’d been in Deadwood for ten months, nearly a year before he left to go after Jordan and he’d been trying to court Lily all that time to no avail. She was having none of it. In all his thirty-eight years, he’d never been turned down by a woman. But she said he was a Yankee and too handsome for his own good and wouldn’t have more than a passing friendship with him. Well, he wasn’t too handsome now, not with the scar on his face from Jordan’s knife. Red and angry, the wound still had the stitches. He needed to see Doc Cochran to get them out, today if possible, after he’d bathed. Then he could get a shave afterward and there wouldn’t be any stitches left for the razor to catch on. He dismounted and tied the horse’s reins to the hitching rail then noticed a new bathhouse next door to Lily’s store. The sign said ‘Bath, shave and haircut’ five dollars. He went in there first. The old man, Richardson, was there working. Zach walked next door to the mercantile. The bell sounded as he entered. The one customer in the store took one look at Zach, and left hurriedly, keeping her face turned and her hand over her mouth as she passed. “Be right with ya’ll,” said Lily. He walked up to the counter. “No hurry,” said Zach, his voice still gravelly from lack of use. Cynthia Woolf is the author of six historical western romance books and one short story with more on the way. She was born in Denver, Colorado and raised in the mountains west of Golden. She spent her early years running wild around the mountain side with her friends.Their closest neighbor was one quarter of a mile away, so her little brother was her playmate and her best friend. That fierce friendship lasted until his death in 2006. Cynthia loves writing and reading romance. 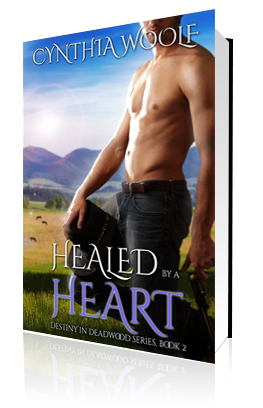 Her first western romance Tame A Wild Heart, was inspired by the story her mother told her of meeting Cynthia’s father on a ranch in Creede, Colorado. Although Tame A Wild Heart takes place in Creede that is the only similarity between the stories. Her father was a cowboy not a bounty hunter and her mother was a nursemaid (called a nanny now) not the ranch owner. Cynthia credits her wonderfully supportive husband Jim and the great friends she’s made at CRW for saving her sanity and allowing her to explore her creativity. Thank you so much for having me on your blog today, Karen. I hope your readers have a good time and enter the contest for the $50 gift card. Good morning, Cynthia, and welcome back to Karen’s Killer Book Bench. Love your westerns and your series! I love cowboys, westerns, and historical…and thanks to Karen I now have a new author to follow, to help keep me in cowboys. Zack is a winner. I think he represents that man who tamed the west, and the kind of guy we all like. He does what has to be done when it has to be done. He’s judge and jury with a strong sense of right and wrong. He’s got a gun, and he knows how and when to use it. Great story, Cynthia! Really super. Wonderful interview. I like learning more about Zack! All the best!